When you write a file to hard disk partition, the data is usually stored to different places (clusters) on the partition. When too many files are written to different places on the hard disk partition, it becomes fragmented. Your computer will slow down with too many file fragments. This page will introduce how to defragment partitions so as to move all fragmented files together and save them contiguously on the partition. Right click the partition which you want to defragment and select "Defragment"
Step2. 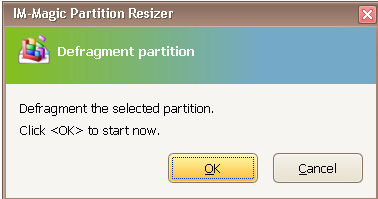 Click "OK" button to confirm defragment the selected partition.